Angus MacGyver is an agent with the Phoenix Foundation. 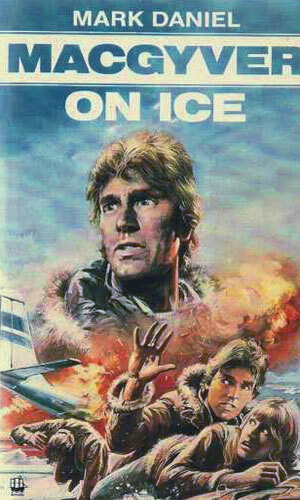 Initially, MacGyver is an agent with the Department of External Services (DXS), one of America's intelligence agencies tasked with operations both inside and outside the borders of the U.S. One of its top case officers was a man named Peter Thornton and in 1979 he met the resourceful and young MacGyver and convinced him to join the team. For the next half decade they worked together all over the globe. The first televises season represents the cases they were involved with during their last year at that organization. In 1986 after six years, MacGyver decided to leave and join the privately funded "think-tank" called the Phoenix Foundation. Its mission was considerably broader than for the DXS and MacGyver was able to get involved in things other than just stopping bad guys or furthering the interests of the current Administration. Law enforcement, environmental projects, social services and others were things that interested MacGyver more than his previous work and he went to the new job gladly. He took his pal and handler, Thornton, with him. MacGyver was born in 1952 (or possibly 1951) in Minnesota. He was an avid hockey player as a teenager and continues to love and play the sport as an adult. After graduating high school, he attended university and earned a degree in physics. Instead of getting a job in that field, though, he obviously felt the wanderlust and spent the next few years doing a variety of things including driving race cars, fighting oil-well fires, and even working at a youth facility. Then he met Thornton who was so impressed with the resourcefulness of MacGyver that he pushed until "Mac", as he is routinely called, finally agreed to work with him. MacGyver is the epitome of resourcefulness and ingenuity. Due to his very intense liking of firearms of any sort, he is forced when falling into danger, something he routinely does, he must find other ways of surviving. Luckily his talents with duct tape and his trusty Swiss Army knife and literally just about anything else "just lying around", coupled with his terrific knowledge of physics allow him to perform what would become known as "macgyverisms", namely ingenious solutions to pull off incredible feats. A couple of these include making a magnifying glass with a hairpin and some white wine and using salt, sugar, and weed killer to make an impressive explosion. Note: for far more information on this incredibly fun character, check out the sites mentioned below in the Links section. A crazed general in Alaska has a plan to take out the Soviet threat by destroying the Soviet Union and he has a bacterial time-bomb to do it. MacGyver must get inside his facility and neutralize it but the man has enough traps laid to challenge even Mac's talents. 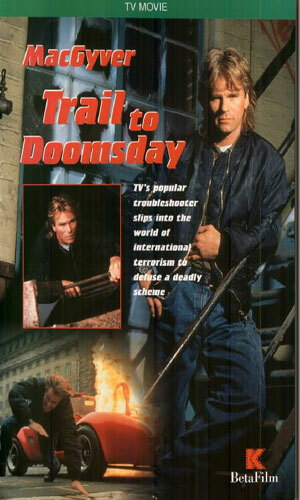 Both movies about MacGyver were made-for-television adventures coming two years after the regular season went off the air. 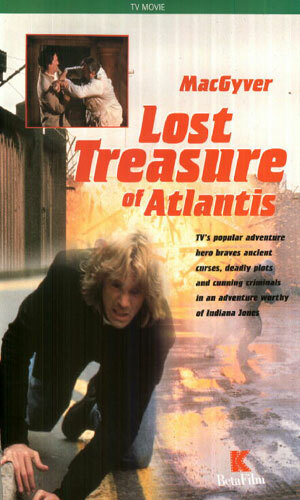 A former archeology professor asks MacGyver's help verifying his discover of the lost city of Atlantis and recovering its treasure. 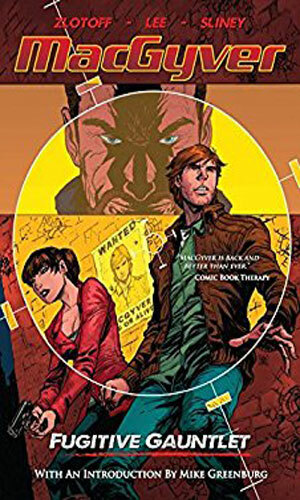 Looking into the murder of an old friend, MacGyver discovers a nuclear weapons facility hidden in the middle of the U.K.
A five-issue series from Image Comics ran from October 2012 to February 2013. It was collected into a single trade paperback and released later in 2013. Trade paperback compilation of the 5-issue mini-series. Getting a plea for his help from an old professor with whom he was hardly close during college, MacGyver is intrigued enough to head to the jungles of Africa. He has perfected a new miracle seed which can grow plants in arid land using salt water. Lots of people will do anything, including killing, to get it. And someone has a multi-million dollar bounty on MacGyver's head. In the Fall of 1985, I was totally hooked when I saw the pilot for the new series on ABC. I wanted a new spy hero. Sean Connery had retired from Bond-hood (then came back) and Roger Moore, as much as I loved him as the Saint, was never my favorite Bond. Timothy Dalton was still a year or two away from taking the helm. On television, there were a few good ones, like Scarecrow and Mrs. King (who would not like Kate Jackson), but I always want more. With the dashing, exciting, entertaining, and exceptionally inventive MacGyver, I got it. I was so far from being a physics expert that it made no difference to me one way or another if the things he did could be done. They looked like they could be and that made for a great story. And Richard Dean Anderson made everything look fun and interesting. Thanks to the beauty of the VCR, I could tape episodes while out with friends or on a date and watch them later. Now, it was nowhere as much fun as now with a DVR or streaming but, hey, it was the 80s and it was hi-tech then. And I had a pretty impressive collection of MacGyver episodes. Boy, did they take up room! Since my main motivation for reading spy novels is the excitement and the story, MacGyver gave me what I wanted and more. Derring-dos in each episode along with beautiful women and exotic sites (or so they made me believe) and a hero who was as close to every-man as you can get, once you look past the handsome and genius qualities. Thirty years later with a new version of MacGyver on television, changing the character somewhat and with a new set of problems to resolve, I still like the character. I refuse to pick one over the other because, hey, no one asked me and no one would give a hoot anyways. The first MacGyver gave me 7 seasons and 139 episodes and two made-for-tv movies. If the second MacGyver gives me a bunch of episodes, I will be happy and appreciative as well.